This is an interesting approach that focuses more on “things to avoid” than “how to do things” in software testing. 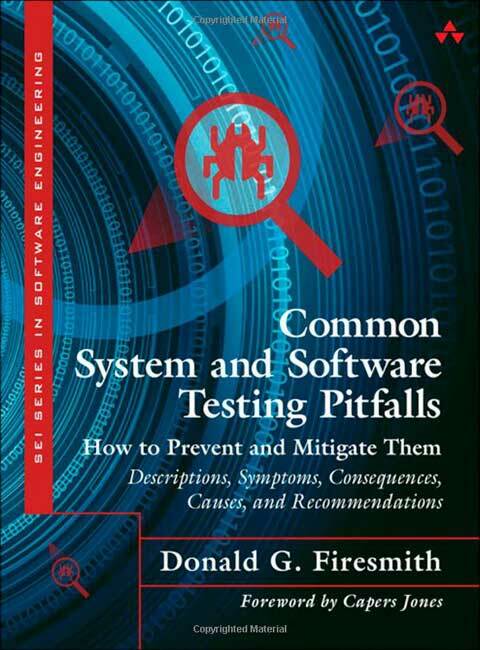 The book is well organized and structured around the presentation of the 92 software testing pitfalls. I was however a little bit disappointed by the book. Written in a “bullet” style, it remembered me the moments where you browse the slides of the conference presentation: you know what the author is talking about, but you feel like you miss some important information that should be associated with each bullet and was transmitted by the speaker. The book seems also biased towards software testing in large projects or regulated context that can be understandable with the SEI background of the author. I am not sure that a lot of projects will be able to produce documents discussed in the book such as a Test and Evaluation Master Plan (TEMP), System Test Plan (STP), Test Strategy Document (TSD), System Engineering Management Plan (SEMP) or Software Development Plan (SDP). This book and the associated web sites can be considered as a valuable resources for software testers that want a structured approach to analyze and improve their software testing process, especially if they work in contexts that requires important software testing efforts or where final products are submitted to official approvals.